Supreme Court Strikes Down Abortion Restrictions In Texas : The Two-Way The justices ruled 5-3 that a Texas law setting requirements for clinics that provide abortions — a law that was expected to cause many clinics to close — was unconstitutional. Abortion rights supporters and opponents wait for rulings in front of the U.S. Supreme Court on Monday in Washington, D.C.
With a 5-3 decision in Whole Woman's Health v. Hellerstedt, the court reversed a decision by the 5th U.S. Circuit Court of Appeals, which had upheld the law. Justices Samuel Alito, Clarence Thomas and Chief Justice John Roberts dissented, while Anthony Kennedy joined the liberal justices in the majority. NPR's Nina Totenberg, reporting from the Supreme Court, says this decision will have consequences around the country — several states have laws (either in effect or currently blocked) with similar requirements to that of Texas. If those laws are found to be essentially the same as Texas' law, Nina says, they will be thrown out by the courts. "First, it requires that all doctors who perform abortions have admitting privileges at a hospital within 30 miles of where the abortion takes place. But because the complication rate from abortions is so minuscule, most abortion providers cannot meet the minimum number of admittances that hospitals require before granting privileges. "Second, the law requires that abortion clinics be retrofitted to meet elaborate statutory hospital-grade standards, including wide corridors, large rooms and other expensive construction and equipment standards that do not apply to all other outpatient facilities where other surgical procedures like liposuction and colonoscopies take place. "The provisions also apply to doctors who prescribe medication-induced abortions; such procedures involve giving the patient two pills and sending her home." The state said the provisions protect women's safety; medical groups such as the American Medical Association and the American College of Obstetricians and Gynecologists said in a brief that the law would not enhance safety and would in fact impede women's care, Nina reports. Opponents of the law said the restrictions would block three-quarters of the state's clinics from providing abortion services, meaning 900,000 women of child-bearing age would need to drive more than 300 miles round-trip to reach a clinic that provides abortions. The 5th U.S. Circuit Court of Appeals upheld the state's law. As Nina reported, the court "said that it did not consider a 300-mile round trip for nearly 1 million women of reproductive age to be a substantial burden because that number was 'nowhere near' a large fraction of the state's 5.4 million women of childbearing age." The Supreme Court rejected that decision, ruling that both provisions constituted an undue burden and are therefore unconstitutional. 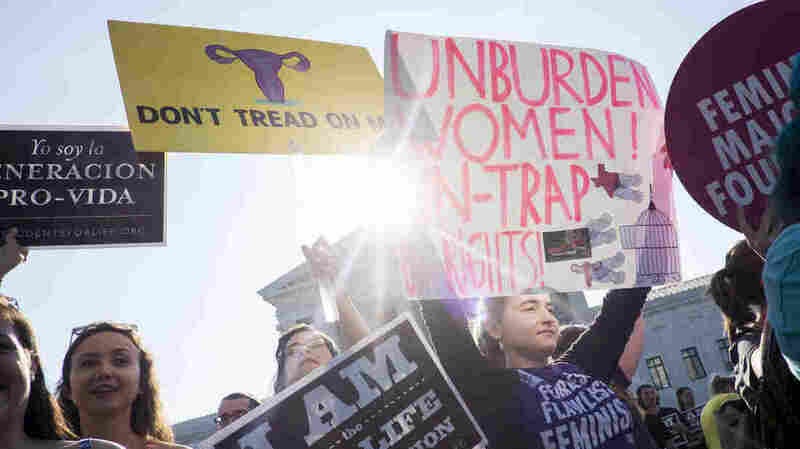 In the majority opinion, Justice Stephen Breyer writes that the restrictions "vastly increase the obstacles confronting women seeking abortions in Texas without providing any benefit to women's health capable of withstanding any meaningful scrutiny." "Nationwide, childbirth is 14 times more likely than abortion to result in death ... but Texas law allows a midwife to oversee childbirth in the patient's own home. Colonoscopy, a procedure that typically takes place outside a hospital (or surgical center) setting, has a mortality rate 10 times higher than an abortion." Abortion rights supporters have hailed the decision. The president of Planned Parenthood, Cecile Richards, said in a statement that the Texas provisions were "dangerous" and the ruling against them is "a win for women." Opponents of abortion rights argued that the now-overturned Texas law would have protected women's safety. Family Research Council President Tony Perkins said in a statement that his organization "will continue our work to protect women and children from the predatory abortion industry." As NPR's Ron Elving reported earlier this year, this case was one where the death of Justice Antonin Scalia might not have been expected to make a difference. With Kennedy joining the liberal bloc of justices, his swing vote was the deciding factor, so "Scalia's vote would have been among the four on the losing side in any event," Ron says.